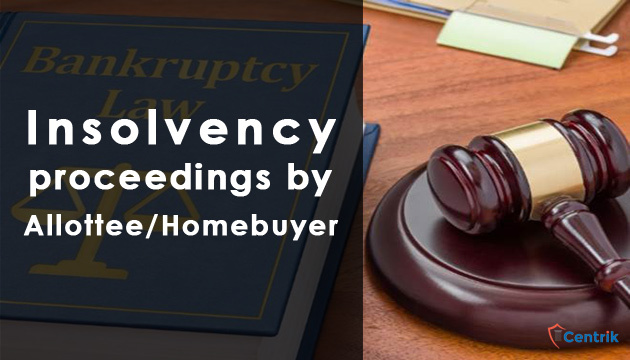 The insolvency and bankruptcy code, 2016 (the code) has seen many ups and downs since the enactment but out of all the most long and debatable topic or issue concerning law was pertaining to the rights of Home buyers/Allottee under the code. Earlier home buyers were not given the status of either operational or financial creditor was the commitment of developer against the advance money or token amount taken by the homebuyer was varying as per the contract or arrangement entered by every developer. Pursuant to the ordinance, recent amendment took place according to which any amount raised from the allottee for a real estate project shall be considered to be an amount having the commercial effect of borrowing provided there was a commitment of assured return to the home buyer till final delivery of possession. Home buyers enter into different contracts with every developer wherein on one hand an assured return is payable whereas on the other hand only a refund in case of cancellation was provided. By providing an inclusive factor to the ordinance all the allottees / home buyers were put under the definition of financial creditors as the money raised from the buyers/allottees was used to finance the real estate project and thus in effect a means of raising finance. NCLAT in the Nikhil Mehta vs AMR Infrastructure Ltd. has very well laid down that amount invested by the buyers came within the meaning of ‘Financial Debt’ as defined under section 5(8)(f) of the code provided such disbursement against consideration is for “time value of money” meaning thereby only those homebuyers who are entitled to the assured return by the developer until the handing over of the possession of the unit or wherein the annual returns filed by the Developer is reflected as the financial cost will fall under the definition of Financial Creditor. Whereas if the homebuyer merely seeks refund of the amount on account of delay in handing over the possession of the unit in that case the flat buyer/Allottee shall not be deemed as the financial creditor. Any amount raised under the transaction of property sale or purchase would be covered under section 5(8)(f) of the code, 2016, therefore the flat buyers fall under the umbrella of the financial creditors. Forward Sale or Purchase Agreement: This ‘forward’ may also be read as future sale or purchase. Any money raised in a transaction of future sale or purchase would qualify for financial debt as defined under 5(8)(f). The product may be a plant, machine or a flat or a home etc. The homebuyers/allottees have the inherent right to file the initiation of corporate insolvency resolution proceedings under section 7 of the code as financial creditor. The ordinance has sought to bring a sense of security and protection to the allottees. Now, however, the question which needs to be addressed is whether the allottees can be treated as a secured creditor given the fact that they have similar rights under RERA and that their payments are now recognised as financial debt under IBC or will they be treated as an unsecured financial creditor who stands much below in line (as compared to secured financial creditors) when it comes to distribution of the proceeds recovered upon liquidation of a company.